Pier 53 Marine offers a small town feel while still being close to the action. Our marina is nestled in West Harbor with easy access to Lake Erie through either Gem Beach boat entrance or West Harbor boat entrance. Either way, you will only be a short ride to the Islands. 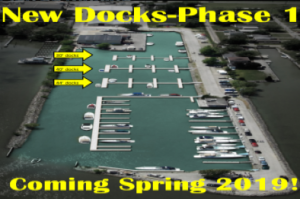 We are also proud to announce NEW DOCKS Phase 1 coming Spring of 2019. Call for details and to reserve your dock now! Pier 53 Marina is gated with 99 slips that can accommodate up to 50ft boats. Each slip is equipped with power and water hook-up and WiFi. The marina has a veranda that houses 8 private air-conditioned restroom/shower rooms. The veranda deck overlooks the marina with a large social gathering space is furnished with chairs, gas grills and picnic tables. Veranda with picnic tables, chairs and gas grills are all available. Have a friend wanting to visit via the waterway? Need a boat dock near the island or short-term dock for fishing on Lake Erie? Pier 53 Marina is your answer. Call us at (419) 797-2300 or click here for pricing and reservations. 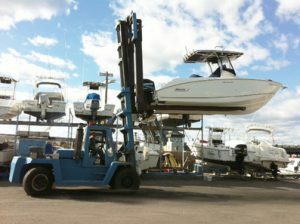 We have docks available to suit your jet ski dockage needs.